Hence this round we stopped by this "PESTA NENAS" stall which is at Sungai Ular, Kuantan and got some pineapples for Ah Mah. It's located at the main road, so it's kinda hard to miss. The fruit were indeed very very. 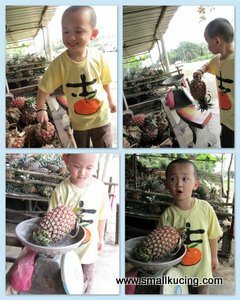 That was why on our journey home, Papa decided to stopped there again to get some more pineapples. Some are being sold by piles while some are sold by kilogramme.Usually, a pile cost RM10. If small fruits you can get 5 fruits to a pile. Papa opted for those RM10 for 3. The size were quite big. Must take one more....BOSS! Kira! 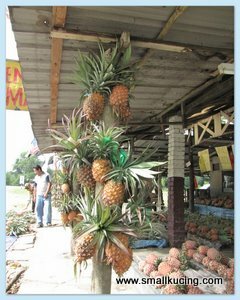 Observed some astonishing sights....Pineapple grows on trees? 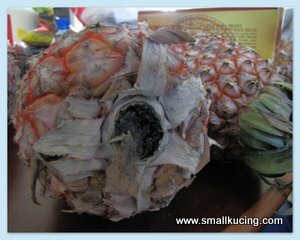 Just too bad when we got home, we found 8 out of the 10 pineapples stem had turned black and the bottom starts to rot. Must be due to being coop up in the car too long. In this case, it's unfit to be given out as gift. Papa managed to walloped most of it while given some to friends whom we know would be understanding and does mind the slight "damaged" fruit. Do check out this Pineapple Stall if you happens to pass by there. Oooh, I love fresh pineapple!! I really need to get some, it's been a long time since I had any. 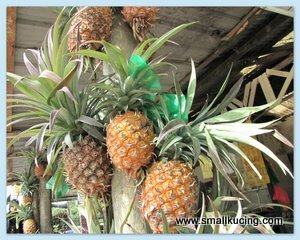 Pineapple grows on trees? How real is this? Wow i have never seen such before. So cheap... Can make pineapple tarts...or pineapple chutney. hahaha, i thot it's really some Pineapple Festival, cheh, the name given to that stall only ah?? errr, bought so much but all "damaged" already ah?? 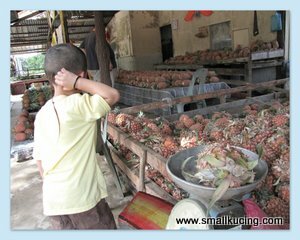 very "gik sum" hor mamarazzi..
Nowadays they sell those honey pineapples.. they are very sweet..
i love i can take pineapples but the most i can take is just a few small mouthfuls unless its pineapple tarts (which means i can eat a few more mouthfuls). Only the bum bum blacken. STill can eat. Kira ok lo. Can still eat one. Only that it's not nice to give people la. Nice how the used the pineapples for the display and that is so unique. Btw, I like pineapples very much, just that lazy to kupas the kulit for it takes up so time. I normally make fresh juice out of it. Btw, the price is really reasonable and worth the buy. 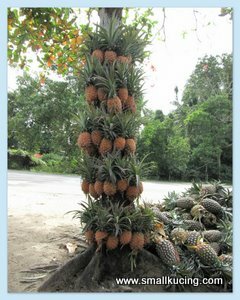 this is rather interesting.. so many pineapples!